Having it “bad” for Walt Disney World, in our eyes, is a good thing! It’s one thing to enjoy a Walt Disney World vacation, but some people turn quickly from fan to fanatic. Are you one of them? 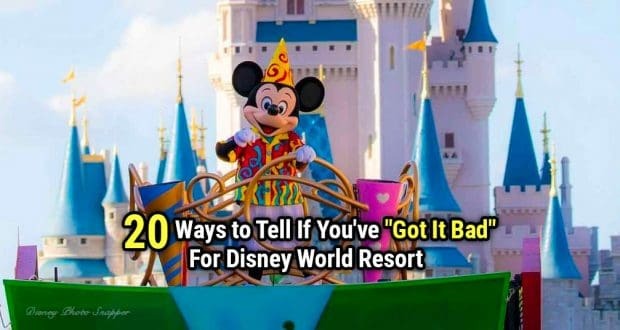 Here are 20 signs that you’re well on your way to having it bad for Walt Disney World! 1. People give you Disney-themed gifts. You’re known as “the Disney person” in many of your social circles. As a result, people are constantly giving you Disney-related gifts for birthdays and holidays. You know you’ve got it bad for Disney when even the office Secret Santa buys you a Minnie Mouse tote bag! 2. Friends tag you on every Disney-related article or post on social media. We know that you’re really trying to be productive at work, but if someone needs to discuss FastPass strategy, you’re there for them! If anyone is planning a Disney vacation, you’re the person they come to with their questions. “Let’s talk Disney” is something your circle understands, and does frequently! 4. You’re planning your next trip the minute you leave. As you exit the park gates for the last time, you’re thinking about your next visit. Let’s be honest- you’re probably also crying. 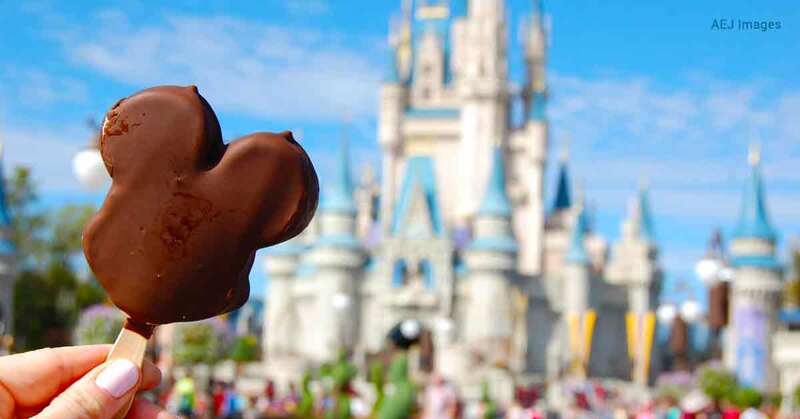 You may have also picked out or even visited the Disney resort hotel you wish to book your next trip! 5. You’re checking wait times on My Disney Experience from home. 6. You’re reading this website while everyone else is on Pinterest. While your friends are “pinning” recipes and decorating ideas, you’re reading up on Disney Fanatic. The fact that you’ve selected this article to read is a pretty good indicator that you have some sort of pretty intense Disney love happening. 7. You have been to WDW so many times that you have routines and favorites there, just like at home. Disney routines vary family to family. Many have one restaurant they always visit or a favorite resort that they consider their home away from home. Perhaps you always end your trip with Tonga Toast at Kona Cafe, or always begin your visit a ride on Pirates of the Caribbean at the Magic Kingdom. 8. You find Hidden Mickeys in everyday life. Hair tie coiled up on your counter? Hidden Mickey. Ring on your table from a coffee mug? Hidden Mickey. See that cloud up there? Hidden Mickey. 9. 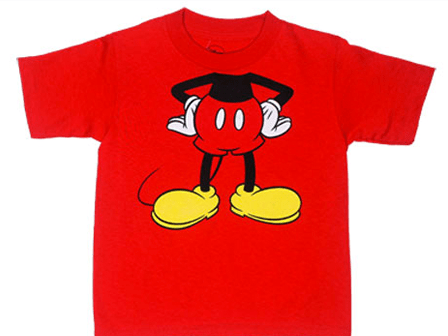 You enjoy Disney clothing and accessories. You’ve found some subtle (and maybe not-so-subtle) ways to incorporate Disney into your daily wardrobe. Perhaps you’ve found some jewelry and accessories that you can wear to work, or you choose to rock your Mickey tees on the daily. Whatever way you wear it, you’re Disney-styled on a regular basis. 10. Take it a step further.. You’re making your own Disney clothing or accessories! Time to open up an Etsy shop, because you’ve been hot-gluing custom mouse ears at the kitchen table all weekend. You’ve also invested in a special machine to make your own shirts. 11. You enjoy listening to Disney music and shows. We’re not just talking about occasionally belting out “Let it Go” in your car. You listen to Disney parks ambient music throughout the day, whether at home or at work. You may even have a favorite “background loop”, like the Adventureland loop or Innoventions loop. You may be listening to Disney podcasts, too. Not only do you like to “talk Disney”, you also enjoy listening to other Disney fanatics talk about Disney news, rumors, and trip planning. 12. You fill your home with Disney tastes & scents. From scented Disney candles (Beach Club lobby, anyone?) to Disney themed coffees, your infusion of Disney into the home goes beyond decor! I’m guilty of making meatloaf in a Mickey-shaped casserole, because everything tastes better when shaped like the mouse! 13. You’ve bought into Disney Vacation Club. You’re fully committed to Walt Disney World being your ultimate vacation destination, so you’ve purchased DVC! This means that you essentially own a piece of the magic, in the form of points that you can use on your Disney resort stays. Points are replenished each year, allowing you to travel to WDW often! There are SO many collectible Disney items, and if you have one (or two, or ten) you’ve definitely got it bad for Disney! What’s your vice? Christmas ornaments, coffee mugs, pins, Sorcerer’s of the Magic Kingdom cards, pressed pennies, or something else? 15. You don’t even hesitate to buy mouse ears anymore, because obviously you NEED them. Millennial pink, rose gold, polka dot, holiday red and green… you love to grab the latest pair, no matter what! Have you seen the ears you can buy at the Epcot Flower and Garden Festival? They’re spectacular! 16. You have weird, hypothetical Disney talks. It’s not uncommon for you and your partner to have conversations like, “if you were teleported to Disney right now, what would you do? Which park are you going to, where would you eat, etc.” This is normal…. right? 17. You can answer pretty much any Disney question someone asks you off the top of your head. You can describe most of the resorts, recommend the best quick-service location in each park, and rattle off a general touring and FastPass usage strategy at the drop of a hat. 18. Your Disney obsession has clearly been passed to your offspring. In fact, it’s so strong that you aren’t sure if it’s just from the environment, or if you literally passed it through your genetics. Your preschool-aged child knows the names of the rides, requests to watch parades on YouTube, and is able to carry on full conversations with someone who has gone on a trip. Perhaps you write about Disney, maintain a vlog, create and sell Disney clothing, or specialize in Disney photography! If your hobby is based on the existence of Walt Disney World, then you’ve clearly got it bad! 20. People have stopped being surprised that you’re going to Disney. Again. People used to say, “You’re going to Disney again?” Now, they don’t bother. Fellow fanatics, we’d love to hear how many of these signs you relate to! What was your first clue that you have it bad for Walt Disney World?